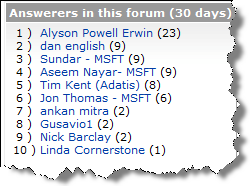 Just checking out my RSS feeds this morning and saw that there was a posting in all of my MSDN forum feeds – This forum is moving the week of 12/8/2008. So I went over to the sandbox area to check out the new social experience Sandbox forum. In the new area you can setup an avatar and put in a little description of yourself. And yes I am a fan of the movie Matrix. 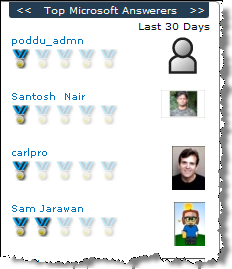 I don’t see a spot in the new profile area to setup your display email like the old forums and the recognition stars have currently been replaced with medals now because of the new addition of the avatar that appears. I do use a gmail account for my display email and the main reason for this non-Microsoft item is because I use Google Alerts to get notified if PerformancePoint, Dan English, or Magenic is used on the Internet so that I can receive daily updates on what is being talked about and stay current. And I currently have two stars and a long way from getting anymore for the time being since you have to go over 2000 points. I am still not sure how the medals work since I don’t have any currently, but we will see how this new layout pans out over the next few weeks and if the medals stick around. There have been comments that people like the old school star recognition and also about using the thumbs up/down approach (why would you get a thumbs down…ouch). I do like how it gives a breakdown on the right of Top Microsoft Answerers, Top MVP Answerers, Recent Moderators, and Top Answerers for the last 30 days off on the right. Before there was a list, but it didn’t give you this kind of a breakout and it was just the Top Answerers in the forum (at least it showed the response number though in the old one). I haven’t seen a posting in the PerformancePoint TechNet forums yet for the switch over to the new format, so maybe it is just the MSDN forums for now…are these really different though (I don’t think so, so we will see tomorrow).